It’s not uncommon for a reviewer’s opinion to be affected by the amount of time they spend with a literary work. Depending on their mood at the moment of engagement, a piece of significant length may seem daunting and tedious or generous and epic. A short work may not provide enough substance to satisfy the audience, or it could effectively utilize its size to leave a concise and powerful impact. In the world of electronic literature, there seems to be a place for works of all sizes. Whether an e-lit piece is considered long, short, or somewhere in between, there is a frequent amount of success achieved in establishing content which is both captivating and enduring all the same. A short piece within the ELC Volume 1 collection which I feel does a good job in harnessing the parameters of its length is “The Cape” by J.R. Carpenter. The piece uses only 9 simplistic pages to tell the story of a trip to Cape Cod. While there is a linear sequence to how each page is presented, the simplicity of the events which unfold makes it seem like their order isn’t really all that important. It ends up feeling like a collection of memorable yet interchangeable event in the narrator’s trip; kind of like how a “perfect day” is usually made up of a number of ideal elements. Due to the short length of the piece, it is all together easy and compelling to experience the story in different chronological arrangements. The images of Cape Cod remain fresh because they can always be revisited instantaneously. I believe that this convenience is the greatest attribute when speaking upon this works length. It is no trouble to dive into and enjoy the story as it is laid out; but it can also be tinkered with and still maintain the same beautiful imagery within the viewer’s mind. I believe that had Carpenter chosen to extend the number of moments in the story, she could potentially have lost the effect due to tedium. In addition, the length of this piece also allows the content to be digested in a reasonable time frame; giving way to more immediate contemplation on the themes presented within. The themes of memories and belief in the realistic accounts of narrators are ideas which are not easy to gather from just one view of this piece. That is why the story’s volume cannot be too overwhelming in content. Indeed, “Cape Cod” is a commendable example of how efficient, provoking and entertaining a piece can be when kept short and simple. Here at Capilano like most universities and colleges, there is a vibrant culture of guest writers coming into speak to the students and community at large. With this first offering of English 214 -Technology + Culture, we decided to take that tradition and twist it a little. And so, in this iteration the guest writer does not come to the classroom but to the course blog. Montreal-based J.R. Carpenter has been our first guest blogger. I met J.R. earlier this year at the ELO Visionary Landscapes conference in Vancouver WA at the beginning of June. Prior to that, she had been working on an RSS project for The Capilano Review. With these confluences gurgling below our English 214 syllabus, it seemed fitting to approach J.R. to lead off this project. Thanks again to J.R. Carpenter for participating in this project! Fingers crossed – we look forward to reprising this in future versions of English 214. And thank you to CultureNet and English Department here at Capilano for assistance in making this event possible. English 214 Question Collective: As you stated in your “Back Story” guest blog, physical photographs possess a certain authority. As the transformative process of selecting a medium for publication moves “The Cape” from print-text to hypertext, does the message/meaning of your story change? J.R. Carpenter: Yes. In every retelling, every story changes slightly. In oral story telling, it is the storyteller who wilfully alters and hones her details and delivery based on the immediacy of audience response. I came to writing through spoken word and performance. I still struggle with the finality of print publication. Once something is published in print it is fixed in time, and, like a physical photograph, cannot easily be altered. I’m not saying that’s a bad thing – I’m saying I struggle with it. The web is infinitely more fluid, flexible, updateable, and alterable. I’m not saying that’s a good thing – I’m saying that I’m more comfortable with publishing when I know I have the possibility of adjusting any part of the text, images or code in response to audience reaction. These slight editorial changes do not always change the message or meaning of they story, but they can influence the reader response in subtle ways. The real question is: Is the print iteration of “The Cape” different from the hypertext iteration, and how? As I wrote in “The Cape: The Back-Story,” I spent a long time trying to expand “The Cape” into a “real” short story. It was hard for me to believe that a story could be so short. In print, the story passes by very quickly. An attentive reader will realize this, slow down, and take the time to fill in the blanks. In the web iteration of “The Cape” there are only ever one, two, or three sentences on a page. The white space around the sentences, the entrespace created between the text and the images, the meta information to be read in the images (including additional text, in some of the diagrammatic images), the pause created by duration of the moving images, and the time lapse between clicking from one page to the next – all these hypertext elements serve to expand the terrain of story. On the other hand, given the visual-centric tendencies of the general web-viewing audience, the visual elements could potentially overshadow the text. Some may read the sentences as merely captions. My favourite iteration of the “The Cape” is the mini-book version. In this small (approx 2 x 2.75inches), inexpensively reproduced, intimate format, the images and the text carry equal weight, being so close in size. The act of turning the page after every sentence adds time and reflective space to the story. And the miniature scale of the book refers subtly to childhood and the children’s book. It is my dream to publish a children’s book iteration of “The Cape” one day. English 214 Question Collective: You mentioned that the Geological Guide photographs interest you more than your own family history. Do you find using fact with fiction allowed you to create a more authentic story? J.R. Carpenter: Yes. True and false are binaries, opposites. Fiction both contains and confounds the either/or of truth and falsehood. This, to me, is more representational of real life than any idealized notion of either historical accuracy or pure fantasy. “The Cape” addresses certain presuppositions – that we all have fond childhood memories of our grandmothers, that little girls want certain things and behave in certain ways, and that Cape Cod is a lovely place to visit – by conflating observations to the contrary of those statements with other irrefutable facts: I never learned to Whistle. I wish I’d asked my uncle to teach me how to spit instead. The Cape, as Cape Cod is often called, is, as you may know, a narrow spit of land. Writing a first-person child narrator is always tricky. No one takes a serious kid seriously. Arming the child narrator of “The Cape” with facts and charts and maps was the least I could do for her. Not that it does her much good. That no one is listening to her is what makes it an authentic story. The older we get, the more we convince ourselves that our memories are true. Why do we trust our own memories of childhood, yet doubt the perceptions of children? These are questions best left to fiction. Mario Vargas Llosa, Letters to a Young Novelist, trans. Natasha Wimmer, NY: Picador, 2002, page 8. English 214 Question Collective: As the work is entitled “The Cape”, the importance of place and memory – as you imply – are highlighted by the imagery in the erosion of the Maritime shorelines and how memories dissipate. This seems to create a strong sense of sublimity within your work. Is this something you have reflected on? J.R. Carpenter: Yes. Notions of place have long pervaded my fiction writing and electronic literature works. In my web-based work the images of place are literally images. Maps figure prominently – operating, often simultaneously as images, interface, metaphors for place, and stand-ins for non-existent family photographs. My parents were immigrants. I grew up in a different country than everyone I was related to. We moved around a lot when I was a kid. I think my early adoption of the internet was due in part to my attraction to it as a placeless place. Many of my works may be read as web “sites” of longing for belonging, for home. The sense of sublimity you mention emerges most strongly when I am writing about long-ago places, and pasts that could never be mine. I barely knew my grandmother Carpenter and can lay no ancestral claim to being “from” Cape Cod. I don’t even know if she was from there. Maybe she just retired to there. Somehow, historical aerial photographs of the coastal erosion of the Cape Cod National Seashore seemed to be the perfect, most sublime representation of this elusive, tenuous, quasi-fictional relationship. For another example, take a look at one of my earliest works of electronic literature: Mythologies of Landforms and Little Girls . Mythologies is a non-linear narrative about a first crush as experienced by two children left to their own devices while the grown-ups are presumably busy elsewhere. A map of Nova Scotia operates as the interface and central image of the piece. I used geological images and terminology to further distance myself from rural Nova Scotia, and childhood in general. In this case, plate tectonic theory seemed to best represent the cataclysmic, renting split between the end of childhood obliviousness and the beginning of adult knowing. the Canadian Maritimes, in dutiful geology. In Nova Scotia it is very easy to believe in Continental drift. A habitual stomach-sleeper, she dreams of falling. Face down, the falling is more like flying; she never hits the ground. Often in her dreams of falling there is a precipice: a clearly defined line before which, perhaps for acres on end, grow grassy, sloping fields of thistle, pock-marked by dry caked dung. And after? Arriving at the precipice all fields and fences end abruptly and fall away. Forty feet below, there lies a beach of stones; a vague sense of bottom. And beyond: an inordinate amount of ocean. J.R. Carpenter || Luckysoap & Co. Tagged as "The Cape", Electronic-Literature, fiction, J.R.Carpenter, Luckysoap & Co.
1) As you stated in your “Back Story” guest blog, physical photographs possess a certain authority. As the transformative process of selecting a medium for publication moves “The Cape” from print-text to hypertext, does the message/meaning of your story change? 2) You mentioned that the Geological Guide photographs interest you more than your own family history. Do you find using fact with fiction allowed you to create a more authentic story? 3) As the work is entitled “The Cape”, the importance of place and memory – as you imply – are highlighted by the imagery in the erosion of the Maritime shorelines and how memories dissipate. This seems to create a strong sense of sublimity within your work. Is this something you have reflected on? 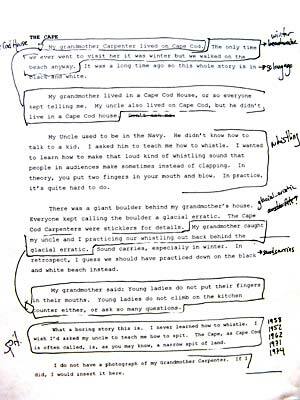 I was thrilled when Aurelea Mahood wrote to me back in September to say she’d be teaching my piece, The Cape, in her E-literature class at Capilano University, on Friday, October 10th, 2008. I would have come into the class to speak about the work in person, but Capilano University is in North Vancouver, British Columbia and I am in Montreal, Quebec. To bridge this vast distance, Aurelea came up with a creative solution: she invited me to be a guest blogger in her class. In this blog post to CultureNet @ CapilanoU, I will present some background information about the creation of the work that wouldn’t necessarily be apparent from viewing/reading it. The students will then discuss and pose questions via blog comments, which I will attempt to answer in a timely manner. Here, then, is (one version of) the back-story of The Cape. I built the web iteration of The Cape over the course of 10 days in August 2005, but some of the sentences in The Cape have been kicking around in my brain since the early 1990s. When I started writing the text of The Cape I was studying Studio Art, with a concentration in Fibres & Sculpture, at Concordia University in Montreal. At the time, I had no idea what to do with such seemingly simplistic yet somehow ponderous sentences as: My grandmother Carpenter lived on Cape Cod in a Cape Cod House. My uncle also lived on Cape Cod, but not in a Cape Cod House. Michel Foucault, Madness & Civilization: A History of Insanity in the Age of Reason, trans. Richard Howard, NY: Vintage, 1988, pages 12-13. I grew up in a maritime climate, in rural Nova Scotia. My father ran a Cape Islander (fishing boat) in the Bay of Fundy. He was English. He left when I was eight and I never saw him or his mother, my grandmother Carpenter, again. I don’t have a photograph of my grandmother Carpenter. If I did, I would insert it here. It’s true that I don’t have a photograph of my grandmother Carpenter, but I do have a photograph of her house, which is indeed a Cape Cod house. In the days before digital photography, a physical photograph had a certain authority – especially if it happened to be the only extant souvenir of a relative disappeared. I realized, when I wrote the above quoted sentence, that I had come to think of the photograph of my grandmother’s house as a photograph of her. I hadn’t given my paternal grandmother’s English-ness, and thus my own English-ness, much thought. I was much more preoccupied with my maternal grandmother, a Jewish, Hungarian, Yiddish-speaking, first-generation American immigrant to the Lower East Side of New York City, with whom I had spent every summer, when I was growing up. Since moving to Montreal I had been attempting to put my rural, maritime origins behind me. Foucault’s phrase “the influence of a maritime climate” and the preposterous notion that “all those fine droplets of water that penetrated the channels and fibers of the human body” would predispose me – a half-English former Maritimer – to madness, opened the door, for me, to the possibility of writing fiction. The Internet was totally textual back then. It had no interface. The joke of the day was, On the Internet no one knows you’re a dog. Everyone was talking about gender politics and how, on the Internet, you could role-play and construct your own identity. At the same time that everyone was obsessed with sexuality they were all claiming disembodiment, which seemed like a contradiction, even then. “A brief history of the Internet as I know it so far,” J. R. Carpenter, Fish Piss, Vol. 2, No. 4, Montreal, QC, Fall/Winter 2003/2004. Around the same time as I was reading too much Foucault for my own good, turning my paternal grandmother into a fictional entity and logging into MUDs and MOOs to tell nonsensical stories to total strangers, I came across a used copy of: Stephen P. Leatherman, Editor, Environmental Geologic Guide to Cape Cod National Seashore; Field Trip Guide Book for the Eastern Section of the Society of Economic Paleontologists & Mineralogists, National Park Service Cooperative Research Unit, University of Massachusetts, Amherst, Mass., 1979. 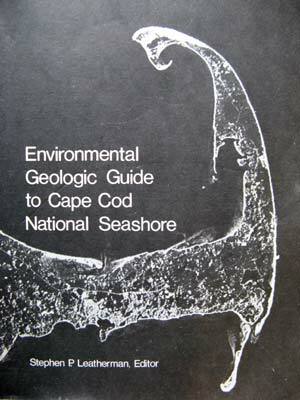 The Geologic Guide contained many photographs of Cape Cod. I had only had the one photo of my grandmother’s house. The Guide was published in 1979, around the time of my one and only brief visit to Cape Cod. The only time we went to visit it was winter but we walked on the beach anyway. 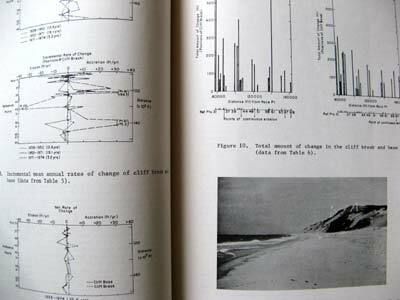 It occurred to me immediately to use the Geologic Guide photographs, charts, graphs and maps as stand-ins for non-existent family photos, and the Guide itself as a surrogate family album. This was much more interesting to me than the truth of what ever my family history had been. If only there was some way to put pictures on the Internet! I can’t say that I woke up one morning and found myself in bed with the computer. My love affair with art was a youthful thing, impractical and highly idyllic. But my tryst with the photocopier was fully sordid and adult. We met at the office. The photocopier made itself invaluable to me by enlarging, reducing and reproducing endlessly. I would tell my friends that I had to work late. I would stay for hours after closing, making collages seemingly out of nothing, liberated in no uncertain terms, or so I thought, from physicality and from preciousness. Guilty of white lies, laziness and copyright infringement, I would scrub my toner stained hands before leaving the office. “A Little Talk About Reproduction,” Fish Piss, Vol. 3, No. 1, Montreal, QC, Fall 2004. It was winter but we walked on the beach anyway. I graduated from art school in 1995, and made my first web project later that year at a residency at The Banff Centre for the Arts (as The Banff Centre was called back then). Many of my early web projects were in black and white because that’s what colour photocopies come in. The images in Fishes & Flying Things , Notions of the Archival in Memory and Deportment  and Mythologies of Landforms and Little Girls  were all scanned from my massive collection of photocopies of diagrams and maps. Although I have since made many works in colour, The Cape  returns to the black and white aesthetic of those early works. This is in part because the Geologic Guide is entirely black and white, and in part because I had actually begun the project at the same time as those works. The Cape visually resembles those earlier works, but uses code elements that did not exist in 1995, such as IFRAMEs and DHTML timelines. The small, moving images you see on some pages of The Cape – on the Sound carries, especially in winter, page, for example – are actually large, still images being pushed behind a small IFRAME window by a long DHTML script. This means, in effect, that the text is moving the image. The use of DHTML timelines produces a silent, jumpy, staggering effect reminiscent of a super-8 film, which is how home movies would have been made in 1979. The main reason it took me so long to create the web iteration of The Cape was not a technical one at all. It was, rather, a literary conundrum. I didn’t know how to make sense of those deceptively simple sentences. What a boring story this is. I revisited The Cape as a short story many times over the years. For a long time I thought the story had to be longer. Then I finally realized it had to be shorter. The shorter a story is, sometimes, the longer it takes to write. In the spring of 2005 an editor invited me to submit a very short story to a very small magazine. I sent The Cape, along with some diagrams from the Geologic Guide. After a decade of editing, the story finally seemed finished when I saw it in print. I immediately set to work on the electronic version. Months after the launch of The Cape, I created a mini-book version – a small, photocopied zine containing the text of The Cape and images from the Geologic Guide. The mini-book iteration of The Cape is exactly the sort of thing I would have made in art school. Finally, the work had come full circle. The Cape has been included in the Electronic Literature Collection Volume One, the Rhizome ArtBase, BathHouse, function:feminism and, most recently, an exhibition in Tasmania called Hunter/Gatherer. I’ve had a wide range of responses to the work. Some people are convinced it’s a true story, because it’s in the first person. Some are convinced I am an American, because Cape Cod is such an iconic American landmark. One reviewer recently wrote with great conviction that I had lived on Cape Cod, and I was a nostalgic for writing about it. I am nostalgic for lots of places, but not for Cape Cod. Cape Cod may well be a real place, but as far as I am concerned, The Cape is fictional. Hunter/Gatherer: Search Theory or Data Bodies in X.s. J.R.Carpenter’s The Cape seeks to convolute fact and fiction by taking us on a user-controlled journey of fragmented narrative. The combination of formal, informal and sometimes seemingly inconsequential information activates an in-between state, a suspension of sorts where information seems ordered in meaningful ways, but we are never quite sure. For example, ‘Cape Cod is a real place, but the events and characters of THE CAPE are fictional. The photographs have been retouched. The diagrams are not to scale’ appears alongside anecdotal familial histories, ‘My grandmother Carpenter lived on Cape Cod, in a Cape Cod House. My uncle also lived on Cape Cod, but not in a Cape Cod house’. Using field trip guide books and environmental guides, old maps, diagrams, and collected source code filtered through a low-tech aura The Cape gracefully addresses the tension between the knowing of and mapping of place and memory by bringing together the connotative powers of fact and fiction. This Friday (10 October 08), CultureNet will be hosting our first e-guest writer J.R. Carpenter. She will be talking with students about “The Cape”, a 2005 piece anthologized in the Electronic Literature Collection Volume 1, and answering the questions that emerge from this discussion. Happily, we are catching her just before she changes locations and heads down to Providence from Montreal to participate in the Interrupt digital literature festival being hosted by John Cayley at Brown University. On Friday, J.R. will be posting an entry on “The Cape”, its composition, and its positioning in the ELC1. This piece will orient our discussion with J.R. and our analysis of “The Cape” as well as the questions that she in turn will field from us. Given the attention paid to place/geography in much of J.R.’s work, it feels appropriate that my initial exposure to J.R.’s work and J.R. herself – her physical self – are firmly rooted in settings central to my own geography. I first met J.R. in the other Vancouver – Vancouver WA – a much smaller Vancouver, but nevertheless a city with ghost echoes of its bigger sister to the north, at the Electronic Literature Organization conference. The mouth of Fraser becomes the mouth of the Columbia. Fort Langley becomes Fort Vancouver. And cafes become beauty supply stores. Quite unaccountably, there are a curiously high number of beauty supply stores in downtown Vancouver WA. It was pleasure to meet her as I had been impressed by her Tributaries & Text-Fed Streams project for The Capilano Review. And so now this Friday, a virtual encounter building a physical encounter building on a exploration of electronic or digital communities and literature. ’til Friday then . . . Tagged as "The Cape", Electronic Literature Collection (Volume 1), J.R. Carpenter, Lucky Soap & Co.